Representative Tulsi Gabbard on Tuesday denounced David Duke, a founder and former grand wizard of a branch of the Ku Klux Klan, rejecting his 2020 endorsement. Duke, who founded a Louisiana branch of the KKK in 1974 and served as the grand wizard of the Knights of the Ku Klux Klan until 1979, on Monday endorsed Gabbard, the first Hindu member of Congress who is expected to be among the Democratic primary candidates. He tweeted “Tulsi Gabbard in 2020. 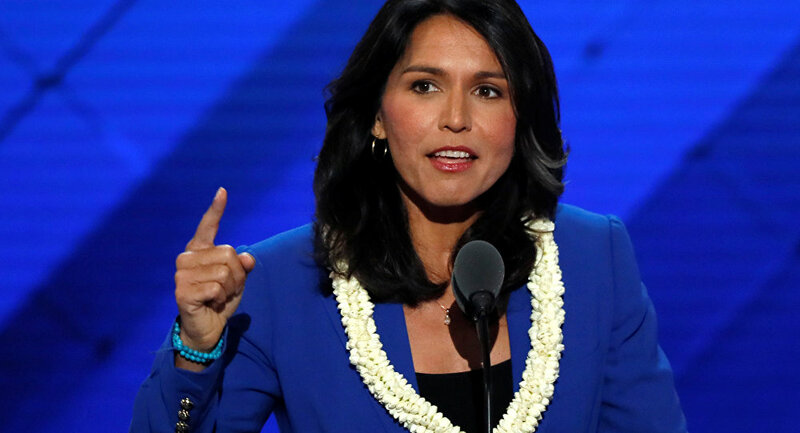 Finally a candidate for President who will really put America First?” and linked to an article about President Trump’s recent proposal to keep troops in Iraq, while referencing Gabbard’s past as an Iraq war veteran and her opposition to military interventionism. — David Duke (@DrDavidDuke) 4 февраля 2019 г.
Duke previously endorsed Trump in 2016 when he was a Republican candidate but has appeared to sour on the president since his coming to office. Trump disavowed Duke's endorsement as soon as he knew about it. Duke also called on Trump in November 2016 to pick Gabbard as his secretary of state, an endorsement which Gabbard also rejected. — Tulsi Gabbard (@TulsiGabbard) 19 декабря 2016 г.
Duke has previously tried to run for Congress and the presidency multiple times. He served in the Louisiana state House of Representatives from 1989 to 1992.